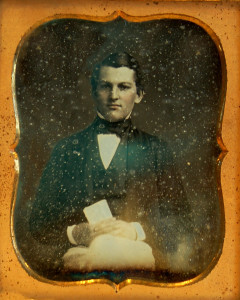 J. Edward Abbott (1828-1855) was born in Andover, the son of Jonathan and Lydia (Phelps) Abbott. He was married in 1852 to Sarah E. Barnard of Andover. He was employed as an “expressman” and was killed in October 8, 1855 in a railroad accident at Melrose. He was buried in West Parish Cemetery. His son Charles E. Abbott, born in February 1856, became in 1911 the Historical Society’s first President.